Welcome to the new series here on Sport Card Collectors! I decided not only would I make a want list of each of the sets I am chasing in a tab, but I thought a little breakdown and feature may help get me more set help. I am sure many of the sets I am seeking are nickel and dime type of cards so I am hoping my trader friends can be on the lookout for any I don't have. In 1995, Pro Line was a product that was easily available. I could find it in local craft shops and pharmacies. There was just a lot about Pro Line I enjoyed especially the 1995 version. The base set looked nice, it also had some fun parallels and the inserts were creative. 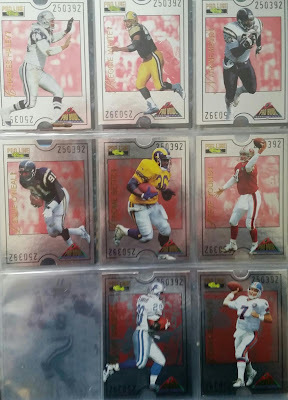 But, none caught my eye like the 1995 Pro Bowl Die cut inserts. Something to do with the die cut and silver foil won me over. The Pro Bowl cards are a 30 card set that fell 1 per retail box. So far I have only accumulated 8 out of the 30 so I have a long ways to go. So I have many needs to go. How many of you remember these or collected them? No Browns in the subset, so I don't own any. I vaguely remember them, but don't remember seeing any recently. I'll keep an eye open but don't know if I'll see any. I like this set too, though I only have the Barry Sanders. You should chase it as well! Cool looking cards. I've definitely seen them before, but not sure if it was 23 years ago... or three months ago at the card show. Now that I know you're looking for them, I'll keep my eyes peeled. Have to admit I don't remember these but that was part of a lull in collecting for me. Nice looking cards. Good luck and if I run across any I'll think of ya.